Personally, I've always been a fan of Thomas Jefferson's decision after he lost the 1796 presidential vote to John Adams when he declined to join Adams' Cabinet. Jefferson's rationale was that he thought he could better serve the nation by leading the "loyal opposition" to Adams' government. Just like that, he created the two-party political system that is still central to American governance today. Even though we live in a one-party town and county today, I think most Boulderites would agree that the competition of ideas that arise from multi-party governance is a good thing. Let's face it, though, while two-party rule sounds good and has generally served us well throughout history, the stuff coming out of our political parties today is tough to stomach. Political polarization has left us with no political center — that part of American society where the fertile ground for political debate lies. Instead of arguing with each other at the same table, we shout at each other from different rooms. It's easy to blame all this bad attitude on the money and ensuing negative campaign ads that force us to constantly exercise the fast-forward button on our DVRs. Maybe a little, but certainly not all. The root problem is how we pick our candidates. Throughout most of America, we delegate the power to decide who gets onto election ballots to the political parties. In representative government, who we elect determines the course of government, so controlling our candidate choices is a lot of power to put in the hands of partisans who may not always place the interests of the governed over the interests of their parties. Does the following sound like American politics today? 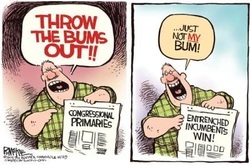 During primaries, candidates pander to partisan extremists to get on their party's ballot and then, if we elect them, we're all stuck with their uncompromising promises as they govern. In 2010, Californians passed Proposition 14 that instituted reforms to their candidate selection process built off of similar reforms instituted earlier in Louisiana and Washington. The goal of these reforms is to take a hatchet to extreme partisanship and the government dysfunction that comes with it by increasing the odds that moderates will make it onto the election ballot. The political parties hate it, but we the people just might like it. The first change is that anyone from any party can vote in any primary, regardless of their political affiliation. So, in addition to allowing Republicans to vote for Democratic candidates and vice versa, the third of active Colorado voters who are independents are instantly in the game of picking candidates. The parties gripe that clever partisans might "game the system" by choosing to vote for sure-losers in the opposing party. Gimme a break. It's hard enough to get people to vote in the primaries at all, much less getting them to vote for someone they don't like. What will happen is that independents and centrist partisans will have far more influence on who gets on the election ballot. It will also encourage politically moderate candidates to run for office since they can appeal to a much broader base of voters. Instant moderation. The second innovation to the election process is that only two candidates are listed on the November ballot for each elected position. However, it's not party affiliation that determines who those two are — it's the two candidates who receive the most votes in the primary. For example, if the top two vote getters are Democrats, there would be only those two Democrats on the ballot, like in this year's County Coroner race. This ensures that candidates will always need to consider how their message sounds to independents and voters from the other party. Those are the votes that could get them on the ballot. This strategy will also bring more moderate candidates from the parties into the game. Plus, third-party candidates with broad appeal would have a far better chance at getting elected if they were one of only two on the election ballot. Political parties do much of the heavy lifting in our democracy and we should respect their hard work and dedication in making government function. In the current system, they are just doing what the law tells them to do. But, the current system isn't working. Other states have some good ideas and we might want to follow their lead. Maybe there will be some unintended consequences, but we can fix that later. We can do it.